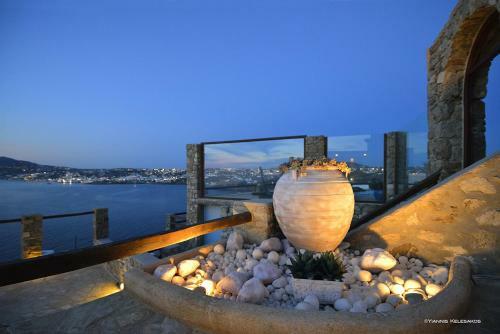 Mykonos is the most elegant and probably the best-known Greek island in the world. The Cycladic Island was discovered by jetsetters in the 60’s and 70’s who made it their number one holiday destination because of its gorgeous beaches, crystal-clear water and its unique charm. This is how the small island got its glamorous image. Even today Mykonos is one of the most coveted holiday spots not only in the Cycladic Archipelago but also in the whole of the Aegean. Its bays and its harbour attract luxury yachts from anywhere around the Mediterranean Sea. So don’t be surprised if you discover a Starbucks branch in one of the white-washed cubic houses on the way from the airport to Chora, totally out of character for a small Greek island. Not far from the harbour you will also find a Louis Vuitton shop and a large number of other exclusive boutiques. 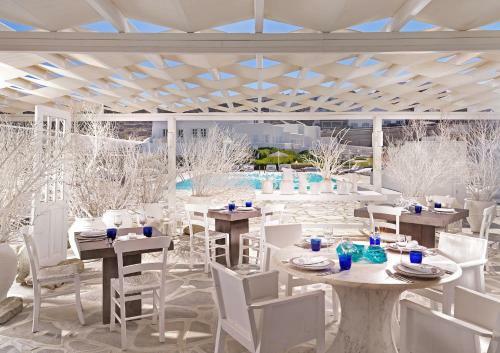 Despite the imported luxury, the illustrious clientele and numerous 5-star-hotels, Mykonos hasn’t lost its authentic Greek character. Those who travel to the Cycladic Island outside the holiday season will have many of the dream beaches all to themselves – and there are real bargains to be made not only in the more ordinary hotels that still exist on the island despite all its glamour, but in the higher-category hotels and luxury places as well. Those who still prefer to go in July and August will have to put up with a lot of hustle and bustle and inflated prices. In return, you get to see things on the glamorous beaches of the island and in the lanes of the beautiful old town of Mykonos Town that you wouldn’t get to see anywhere else. Bars, restaurants and boutiques jostling for space, wild all –night parties of the gay community in the clubs of the ‘Little Venice’ district (the legendary Jackie O., perhaps), and on an evening stroll in the Old Town a realistic chance to come across celebs like Naomi Campbell, Valentino, Sarah J. Parker or Leonardo di Caprio. Mykonos miraculously keeps its unique charm, even when the high season is upon the island and places to stay are bursting at the seams. The soft light of the Cyclades, the undulating landscape and the cube-shaped houses and hotels snuggled into the slopes – all this creates an atmosphere of casual nonchalance, only disturbed by passengers of several cruise ships who briefly swamp the island and then are gone again. For those who can’t wait for the intruders to leave, there is an escape route to remote beaches in the north and southeast of the island, at most a 20 kilometre trip. Once there, possibilities are endless, from surfing to lazing on comfy deckchairs with a cocktail to peace and quiet between the dunes – a holiday on Mykonos has it all. Cultured visitors won’t be disappointed either; Mykonos is an ideal base for excursions to the neighbouring island of Delos, one of the most important archaeological sites in Greece and a perfect counterpoint to the cheerful parties next door. Only two kilometres north of Mykonos Town lies the popular beach of Agios Stefanos, with a beautiful view of the uninhabited Cyclades Island of Delos and its historic sites. Tourist facilities are excellent here, offering water-sport options like windsurfing and water-skiing, other sporting activities like beach volleyball and there are deckchairs for hire for those who want to recover from those activities or those who just want to rest. There are numerous taverns and cafes right on the beach as well, and a variety of accommodation options further inland. The sandy beach gently slopes into the sea, ideal for families with children who can safely play in the warm, shallow water. There is a regular bus service between Agios Stefanos and Mykonos Town. Traditional village life that is still part of the character of so many Greek islands is no longer found on the popular island of Mykonos. Ano Mera has at least a traditional village square with a few kafenions and tavernas where you can chat to the locals over a glass of ouzo. The restaurant Opi Apomeine is highly recommended for its barbecue specialties. There is no village without at least one monastery, and the one in Ano Mera is famous for its marble façade. Ano Mera is for holiday-makers who like a slow and uneventful life-style. In the south east of the island of Mykonos, Elia Beach is one of the best beaches. Fine white sand and a gentle slope into the shallow water is always a favourite with families. Elia Beach is also popular with the gay community, but not exclusively. It is easily accessible by bus from Mykonos Town. The large beach restaurant doubles up as a tourist shop, where people can purchase essentials for the beach. Whoever has come to Mykonos for the very first time should try an experiment: pick the early morning or the early afternoon to walk in the maze of tiny lanes and just allow yourself to get lost. You will discover so many picturesque Greek houses, gardens, little churches and tiny squares that it makes you dizzy. Once you know your way around, everything falls into place: the three main roads in the centre (Matogianni, Enoplon Dynameon and Metropolis) can be used as a point of reference. Restaurants are mainly by the waterfront, and so are the famous windmills that never fail to impress and are on most picture postcards. The sunset is spectacular and unforgettable. The location of the former fishing village of Ornos is an ideal starting point to explore the whole island of Mykonos. From the little harbour holiday-makers can take a boat to a different bay or beach of the Cyclades Island every day. Ornos has a big variety of accommodation options for every budget. Sport, entertainment and culinary offers are the best on the island. Platis Gialos has an excellent tourist infrastructure: a well-managed sandy beach with deckchairs galore, restaurants, cafes and a huge selection of accommodation possibilities. There is a regular bus service to Mykonos Town, and another two popular beaches are only a short walk away. There is the legendary Psarou Beach where champagne is served at every party and where paparazzi set up camp to get a few photos of celebrities who drop by in their luxury yachts. South-east of Platis Gialos lies Paranga Beach, less exclusive and much more relaxed. The footpath winding its way along the hillside, halfway between the sea and the line of houses, is very scenic, especially in the light of the setting sun.